I'm not sure if there is anything better than fresh, warm goats milk mozzarella! There's a quick & easy way to make it...and then there's the way that takes a bit more time but reaps LOTS of yummy benefits! Because I'm time challenged much of the time, I went with the quick & easy method and used the 30 Min Mozzarella Recipe today...grab some milk from your goat (or your neighbor's goat :)) and give it a try! a goats milk mozzarella completed pizza! 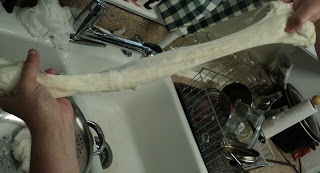 I usually re-use the whey from all my cheeses and make Ricotta or Crumbles but the whey from the 30 Min Mozzarella Recipe will need to be recycled by feeding it to your farm critters - my doggies love it too.